If the idea of spending time perched up a ladder repairing and painting the fascia boards of your home isn’t your idea of fun, you need to consider having your home fitted with PVC-u facia’s & soffits from Ultimate. They will not rot or warp, in fact they are maintenance free. The only thing you may wish to do is simply give them a wipe over with a damp cloth. Their brilliance is truly remarkable, as they add the final finishing touches to the exterior of your home. Say goodbye to maintenance forever! And say hello to your new soffits and fascia’s from Ultimate Windows and conservatories. You don’t need to worry about any problems and complications for your house if you choose Ultimate Roofline. Roofline Middlesbrough provides quality and efficient rooflines that will protect your home from whatever weather comes your way. Feel safe in your home with our rooflines that come in a range of colours and that won’t peel, rot, flake and lasts a lifetime. Roofline Middlesbrough can be found in the areas of Stokesley, Nunthorpe and other parts of Middlesbrough. Want to keep your house fresh, then look for Roofline Middlesbrough, call Ultimate now. Every new home should feel secure, so choose Ultimate. Our rooflines make sure that they enhance a home’s appearance from the outside. 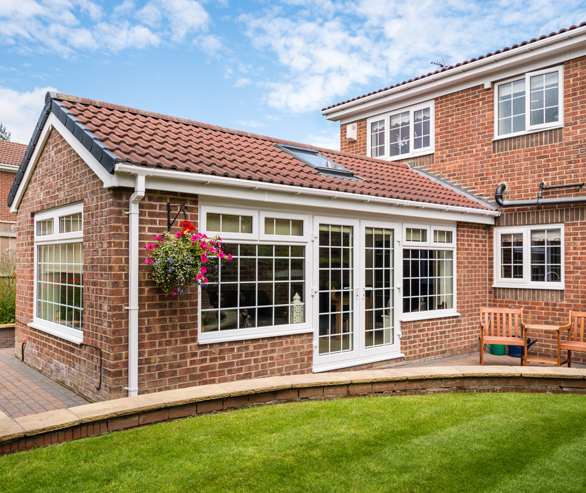 Roofline Stockton develops a range of stylish options that suits any. Whether it is timber, oak, or white effects our rooflines last as long as your home stands. Roofline Stockton can be found in the surroundings areas of Norton, Yarm, Billingham, Thronaby and other parts of Stockton. Transform your home’s appearance, look for Roofline Stockton, call Ultimate now. No house should have poor quality woodwork, try Ultimate. Many of our rooflines provides a service that makes your home stand out on show with no rotting, flaking in site. Our rooflines come in a variety of colours ranging from white, black to original wood effects. Many of them are of bargeboards or soffits. All types can be fitted in with no worry and without the need for regular maintenance. Roofline Darlington can be situated in the areas of Aycliffe, Spennymoor, Bishop Auckland and other areas of Darlington. Need quality woodwork added to your home, look for Roofline Darlington, call Ultimate now. Quote Send us your details and we will contact you with a free quote. Brochure Download a brochure from our range of products. Ultimate windows, doors and conservatories, for all your home needs, supplying, middlesbrough, stockton, darlington, redcar, billingham, yarm, whitby.